As Halloween approaches, I’m reminded of my childhood years trick-or-treating. I was good at bringing home a huge haul of candy. And, I was also pretty good at collecting money. In elementary school, my teacher distributed UNICEF boxes to students. I think I was around 10-years-old when I received my first orange-and-black box. The colors of the box immediately caught my attention because they just happened to be our school colors. When my teacher explained that UNICEF helps children in need around the world, my friends and I were revved-up to help by raising money from our neighbors. To get, you have to ask. As a kid, I knew I had two choices on Halloween; I could 1) sit at home and not have any candy, or 2) put on a costume, knock on doors, and ask for candy. Even as a 10-year-old, it didn’t take much effort to figure out that if I wanted to eat candy, I had to get off my rear-end, and go ask for it. Well, the same principle applied to UNICEF. If I wanted to have money in my box to help kids in need when I returned to school, I’d have to ask for it. I think you’ll agree that I discovered a pretty simple principle. But, if it’s so simple, why do so many development professionals avoid asking? At one major, prestigious university medical school, the major gift officers would not get out from behind their desks to go visit prospective donors. Sure, they’d go on the road occasionally, but they never saw as many alumni as they could or should have. To solve the problem overnight, the head of advancement got rid of the offices. Yes, it was an extreme move. No, it was not a particularly elegant solution. The thinking was that the major gift officers couldn’t hide in their offices if there were no offices. When they were on-campus, they could work in a bullpen to set appointments. Without an office or even a desk of their own, being on campus wasn’t very comfortable. So, some of the major gift officers quit while the others went out and started asking more people for donations. The school started raising much more money. When my teacher distributed the UNICEF boxes, she explained what the organization would do with the money. Then, she asked us if we would agree to raise money to help kids in need. When we all agreed, the teacher added something else. She said that she wanted us to ask others to give only after we had donated first. She told us that we couldn’t expect others to support UNICEF if we weren’t willing to do so. It was a great lesson to learn early. When I was standing in a neighbor’s doorway with my orange-and-black box, I was able to say something like, “I’ve donated what I can to UNICEF. Can you please give something to help needy kids, too?” There was no way an adult was going to say “No” to a little kid after that. Earlier this month, The Stelter Company presented the findings of its latest research project at the Partnership for Philanthropic Planning’s 2012 National Conference on Philanthropic Planning. 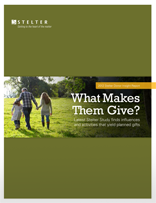 What Makes Them Give: 2012 Stelter Donor Insight Report is the Company’s third study of planned giving in the United States. As a nerd and as the winner of the 2011 Association of Fundraising Professionals/Skystone Partners Prize for Research in Fundraising and Philanthropy, I enjoyed reading the report. And, I thank The Stelter Company for adding to the nonprofit sector’s base of knowledge. While flawed, the report does offer some interesting tidbits. This post will examine some of the useful tidbits and problematic flaws. Some of the insights are new while others will confirm what experienced gift planners have long known or suspected. Perhaps the most interesting finding is that 21 percent of those who have made a planned gift “never donated to the charity before putting a planned gift in place.” An additional 20 percent did give to the charity prior to making a planned gift, but did so for less than five years. 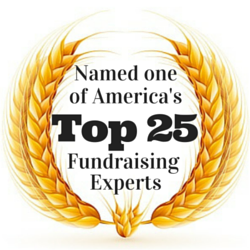 The conventional wisdom has been that loyal donors make the best planned giving prospects. However, the report shows that 41 percent of planned gift donors are outside of the loyal-donor model. This underscores the importance of making planned gift messaging ubiquitous. Among those who have made a planned gift and who have also made an annual giving donation to the charity, 40 percent gave less than $500. Only 16 percent have given $5,000 or more. While the old donor pyramid, where small donors become major donors and then become planned gift donors, may be true for many, the vast majority of planned gift donors have not first been major donors. This means that, when looking for prospective planned gift donors, development professionals must consider the organization’s entire database. This includes large donors, medium donors, small donors, and even non-donors. 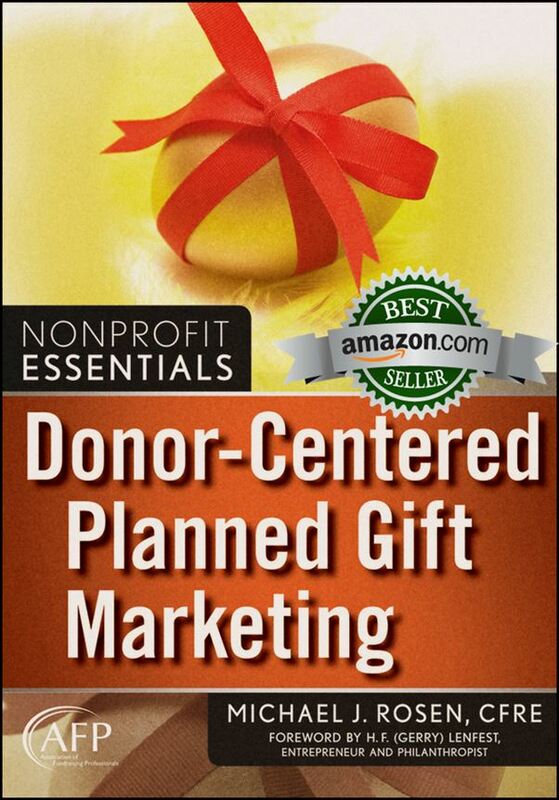 The study found that “a bequest is the most popular vehicle for planned giving.” The report confirms what has been a long-held belief among gift planners and a fact that I included in my book, Donor-Centered Planned Gift Marketing. This is good news for all nonprofit organizations. Virtually all nonprofits can easily and inexpensively promote bequest giving. For those organizations with a bit more expertise and resources, a bequest conversation or a bequest commitment may provide a gateway for a conversation with the donor about more complex giving vehicles. If the market finds a bequest to be the most popular form of planned giving, savvy planned gift marketers will take notice and market accordingly. On the other hand, bequest giving may be the most popular vehicle because it is the one that is already most widely promoted by the nonprofit sector; perhaps this should be examined in a future study. Among those who have made a planned gift, 49 percent say that they have not told the charity. This raises an important question not asked as part of this study: Why haven’t you told the charity? I suspect that many donors simply consider their estate planning a private matter and, therefore, choose not to disclose a planned gift provision to the charity that will benefit. I also suspect that others do not want recognition from the charity that they suspect will lead to more pressure to give more either to that charity or another nonprofit organization that takes notice. But, the biggest reason for nondisclosure may simply be that donors do not understand the value of disclosure to themselves and to the organization. Development professionals need to do a better job of articulating the benefits of disclosure to encourage more donors to do it. The report found, “Almost one-fourth of major donors, current planned givers and best prospects in their 40s would like to connect with nonprofits on Facebook.” Donors and prospects are using social media. Smart development professionals will meet donors and prospects where they are. This means including social media in the marketing mix. Only 26 percent of planned gift donors and best prospects — “people who say they will definitely or probably make a planned gift in the future” — say they have received a letter or email about planned giving. Only 17 percent say they have been asked directly for a planned gift. If nonprofit organizations want more planned gifts, they need to ask more people, more often, and in the right way. With so few people receiving direct planned giving communications, there is not a high-degree of competition. On the other hand, this means tremendous potential. October 2012 has not been a good month for Lance Armstrong, the former cycling champion. Following the release of the USADA evidence, Nike and Anheuser-Busch announced they would not be continuing their endorsement relationships with Armstrong. However, both companies expressed their intentions to continue support of The LIVESTRONG Foundation. As the doping controversy intensified, Armstrong made the decision to step down as Chairman of The LIVESTRONG Foundation though he will continue to serve on the board. You can read the official statement from LIVESTRONG and Armstrong here. I recently came across an advertisement from the United States Holocaust Memorial Museum. The ad appeared in The Jewish Exponent. While the ad itself was not particularly remarkable, the mere fact it existed in a weekly newspaper in Philadelphia did strike me as noteworthy. Let me explain what made the ad special. The Museum, with its home in Washington, DC, was not promoting a special exhibition. It was not encouraging visitation at all. Instead, it was a fundraising ad. In recognition of its upcoming 20th anniversary, the Museum ran the ad to promote a special challenge grant designed to encourage people to make a planned gift to the institution. I’m not going to discuss the strengths and weaknesses of the ad itself. I’m not even going to distract you with an image of the ad. While the ad promoted planned giving, the important lesson here is applicable to any development effort. Therefore, instead of focusing on the content of the ad, I want to focus on where the ad appeared. I did not see the ad in one of the Museum’s publications, though it may have appeared there. I’m not a donor or member. I saw the ad in an independent publication, read by thos e who may or may not be current Museum supporters. Most nonprofit organizations market to existing donors and/or members. With 170,000 members, the Museum certainly has plenty of people to market to. And, it does. But, given the special occasion of its 20th anniversary, the Museum sought to broaden its outreach. By placing an ad in the Exponent, the Museum has reached tens of thousands of Jewish people who may not currently support the institution and who may or may not have even visited. Nevertheless, these individuals may have an enormous interest in helping the Museum to secure its future. When looking to broaden its outreach, the Museum looked at who its likely supporters would be. Then, it considered where those potential supporters are. To reach engaged Jewish people in a nearby metropolitan area, the Museum wisely chose the Exponent. The Museum did not simply make a wish that folks would visit its website. Its development team did not rely on public service announcements broadcast to a broader population at four o’clock in the morning. No. The Museum proactively targeted an appropriately defined market segment and met those individuals where they spend time: in the pages of the Exponent. Whether seeking planned giving, annual fund, capital campaign, membership, or special event support, it is certainly important to market to those closest to the organization, those already engaged. However, to acquire new donors, members, or participants, organizations need to look carefully at potential target populations and, then, determine where to find those individuals. In short, nonprofit organizations need to be where their prospective donors are. The 2012 Partnership for Philanthropic Planning’s National Conference on Philanthropic Planning has come and gone. I thought it was a terrific conference in New Orleans because of the efforts of staff and the volunteers. 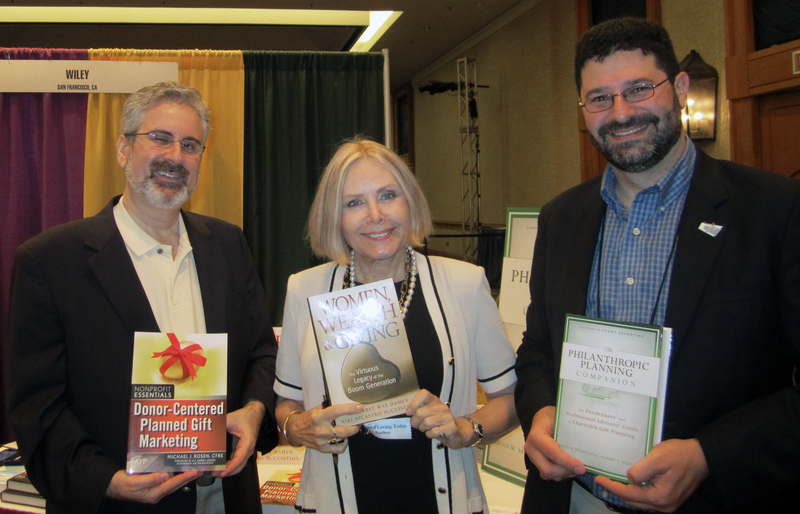 Personally, I enjoyed co-facilitating a session, attending other sessions, meeting PPP’s new President/CEO, selling and signing copies of my book (Donor-Centered Planned Gift Marketing), seeing old buddies, and making new friends. In New Orleans, leaders from PPP councils from around the country gathered for the Council Conversation. Philip Purcell, JD (Past President of the Planned Giving Group of Indiana), Barbara Yeager (Director of Operations at PPP), and I (Immediate Past President of PPP of Greater Philadelphia) facilitated the gathering. The program looked at “Tips for Teaching Adult Learners” and two innovative program ideas: World Café and Pecha Kucha. PPP will be posting the materials from the Council Conversation on its website. If you would like to discuss having me do a presentation for your group, please contact me. During the conference, Michael Kenyon was introduced as PPP’s new President/CEO. I first wrote about Kenyon when his hiring was announced. In New Orleans, I had the opportunity to speak with him for a few moments. He’s eager to assume the helm of PPP later this month. He’s passionate about the organization and is looking forward to building on its strengths. I wish him well. If you attended the conference, you know that there were often many sessions of interest being presented at the same time. It was impossible to participate in all of them. If you weren’t in New Orleans, you sadly missed them all. However, you don’t need to feel too disappointed. PPP recorded virtually all of the sessions and is making them available in two formats: MP3 ($13 per session) and CD ($15 per session). A complete set of conference MP3 recordings is $199. For a complete list of recorded sessions and to order recordings online, visit AVEN-Audio Visual Education Network. Do you know the impact of your nonprofit organization? Chances are, I probably got you thinking about the people your organization benefits, its core mission. The public recognizes that reputable nonprofit organizations benefit the people they serve. However, people tend not to think beyond that impact. Even among nonprofit professionals, maybe even you, the focus tends to be on those served directly. However, nonprofit organizations have a far broader impact. Yes, hospitals heal patients; universities educate students; symphony orchestras entertain audiences; museums expand our minds; disease research foundations seek cures. But, beyond their core missions, nonprofit organizations do much more for society. Despite being tax exempt, nonprofit organizations generate tax revenue. They employ people, and those people pay income taxes and sales taxes. They help support local businesses such as furniture retailers, office supply stores, restaurants, hotels, and many others. Those businesses, in turn, pay taxes and employ staff. Simply put, nonprofit organizations have a profound economic ripple effect. Their benefit to society goes far beyond those they serve. Recently, the Greater Philadelphia Cultural Alliance sought to quantify the economic impact of the arts and cultural nonprofit organizations in the Philadelphia area. The result of GPCA’s effort is the report The Arts, Culture and Economic Prosperity in Greater Philadelphia. Generating 44,000 full-time equivalent jobs, Philadelphia’s arts and culture sector has a profound $3.3 billion impact on the region’s economy including $1 billion to local residents in the form of paychecks and household income and $169 million in tax revenues for state and local governments, according to the research report. The report also compares Philadelphia against 181 other cities, regions and communities to show how Philadelphia and its cultural community stack up against the rest of the country. Among participating regions, Southeastern Pennsylvania’s cultural sector ranks first in job creation, accounting for 11 jobs per thousand residents, nearly double the national average.